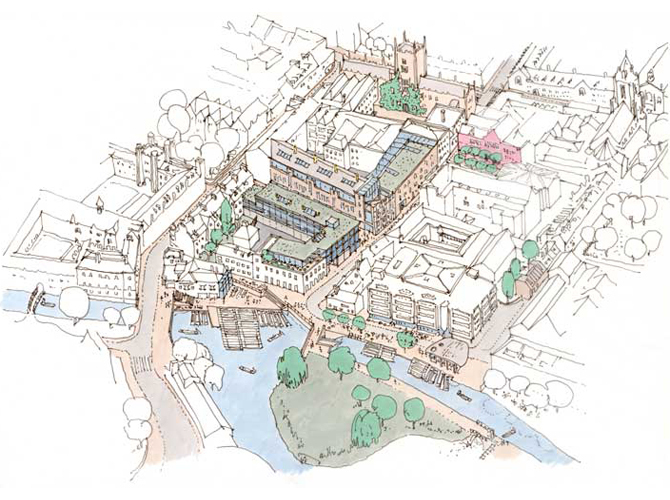 This urban design was produced for the Cambridge Architecture gazette, a magazine produced twice yearly by the Cambridge Association of Architects. Bobby Open was joint editor on issues 56-63. The proposal looked at improvements to the way the Mill Lane area works for pedestrians and tourists. Three urban moves are key to the proposal: the removal of the warehouse building on the Mill Pond to make way for a new public square on the river, a new connection between the Silver Street bridge and the square, and a new pedestrian street connecting through from Silver Street. Car parking would be below ground, beneath new mixed use buildings. Allies and Morrison architects are currently masterplanning the Mill Lane redevelopment.